The Lotus Evora Cup Racecar Exposed! 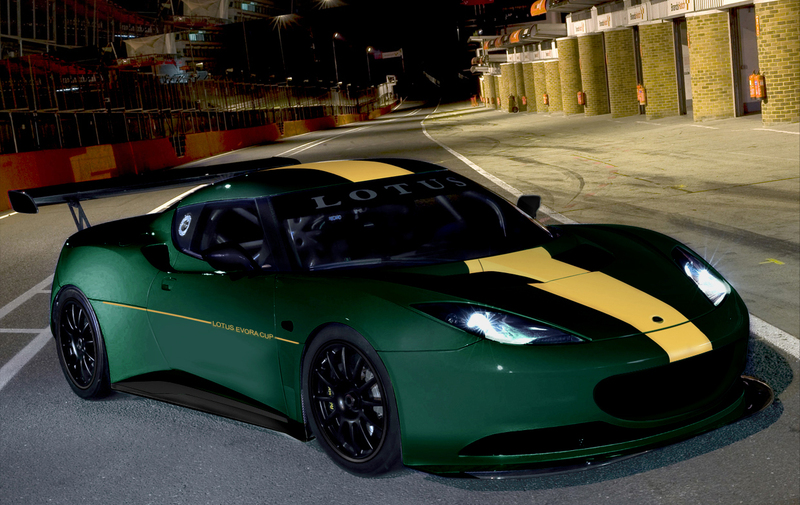 Lotus turns their newest mid-engined sportscar into a full-blooded racer for the 2010 Lotus Evora Cup series. Developed by Lotus Motorsport, the Evora Cup is a GT4-spec racer that is also eligible for a number of national and international race series. The Evora’s mid-engine design, stiff chassis, and double wishbone suspension made the transformation from production car to a racecar an easier task for Lotus Motorsport. The mid-mounted 3.5-liter Toyota V-6 in the production Evora displaces 4.0-liters in the Cup car, and receives a performance air filter, dry sump system, and motorsport ECU. The new 4.0-liter produces 400 hp at 7,000 RPM and 295 lb-ft. of torque at 6,000 RPM, and sends power to the rear wheels through a Cima six-speed, sequential paddle shift transmission. Six-piston front brake calipers with two-piece aluminum bellied brake discs provide unrivaled stopping power. The Evora Cup is also fitted with adjustable motorsport dampers, allowing for optimum handling. A lightweight aerodynamics package developed by Dallara utilizes carbon fiber parts to increase downforce for optimal handling, and redirect air for improved cooling. Over 440 lbs. has been shed from the Evora with the use of high performance parts and removal of unnecessary equipment, bringing the weight down to a mere 2,645 lbs. The Evora Cup will have a fire extinguisher standard along with an electrical cut off, traction control, and FIA compatible equipment. The 2010 Evora Cup Series will be held in Europe, concluding with two Lotus festivals in Donington Park in the UK (October 16–17, 2010) and the second at Vallelunga in Italy (November 21-22, 2010). Five points will be awarded for entering each race, with an additional five points for a first place finish, down to one point for a fifth place finish. Double points will be awarded at both Lotus festivals. The driver who is awarded the most points from a maximum of six races will be crowned champion. A prize fund of at least €100,000 will be available. The Evora Cup will be available for £120,000 before taxes, and will be presented at the 2010 Geneva Motor Show in March. Buyers may register their interest at http://www.lotusevoracup.com Availability for the North American market is yet to be determined. Unladen Vehicle Mass: 2,645 lbs.